Original 1st (black and white pre-concert) printing 22&1/2 x 17&1/2" concert poster for "BUSTED! ", a benefit for the San Francisco Mime Troupe at the Fillmore Auditorium in San Francisco, CA on 4/12/1967. 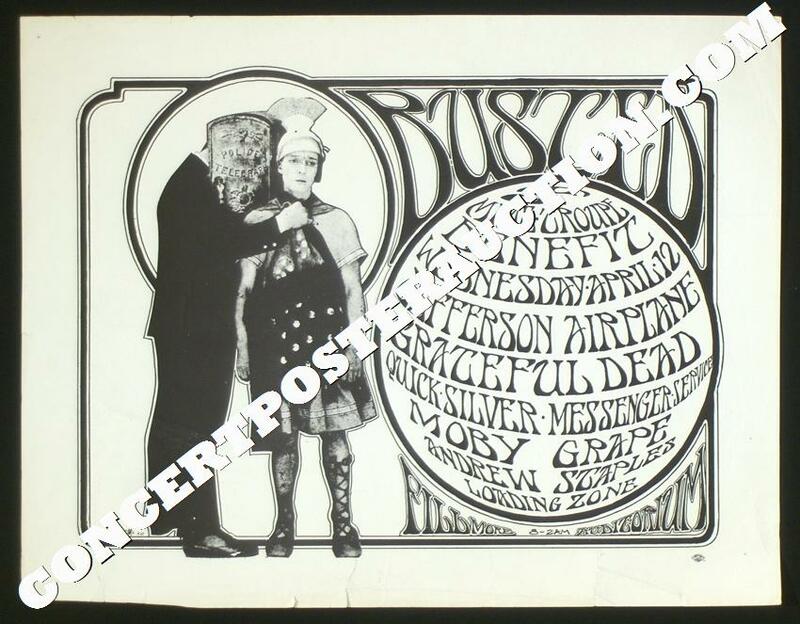 The Bill Graham-sponsored event featured performances by the Grateful Dead, Jefferson Airplane, Moby Grape, Quicksilver Messenger Service, Andrew Staples and Loading Zone. Art by Stanley Mouse and Alton Kelley, image is featured in the Art of Rock on page 151 (plate 2.71). Medium flat stock poster is in OK/used (B-/C+) condition; a heavily worn bottom edge (several tears ranging in size from 1/4" to 2", a couple of pronounced bends/creases and a 6&1/2 x 1/2" area of missing paper in the lower left margin), a pair of tack holes in the upper margins, a few scattered surface dings/scrapes and a few small tears/nicks around the outer edges, otherwise not too bad looking... a charming used/worn example of this classic Mouse/Kelley image.